After teleporting to another location the Rogue´s model becomes invisible and takes no damage from enemies, not even poison. 3)Repeat until bug is achieved. Having the rest of the party dead may help. The rogue apearing on the targeted spot and operating as norma. I was fighting the Spider Queen on Hard difficulty. Party was nearly dead and the Rouge was engaged by one or two spiders. Made her jump to the other end of the mob. 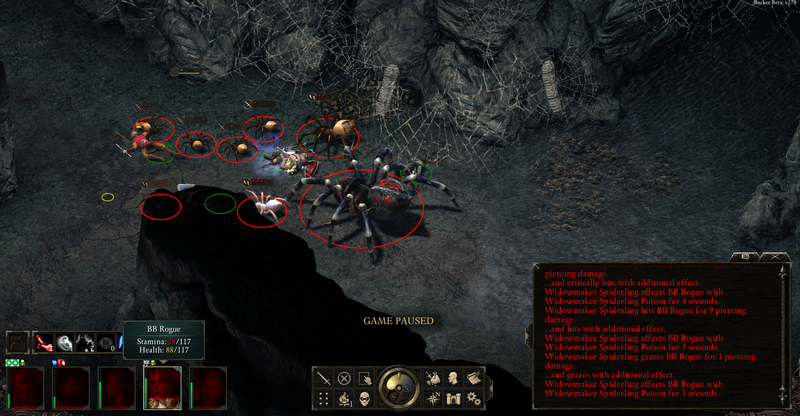 She re-apeared a few meters from her starting position with an invisible model being unable to attack or move, still being attacked by every spider and the damage registering in the combat log but without the rouge´s health going down. Employed heavy use of the pause. Waited for a while and her stamina never went below 28. I cant think of what is causing this bug. I might have experienced the same bug with the wolves but since I won that encounter the rouge probably re-apeared while in the spider encounter since it was a TPW and combat didnt end, the Rogue stayed glitched. Thats all I can think off. Fiebras: I actually reported the very same bug for the last build, so sadly, this means it's still in, and it's a pretty frustrating one at that. In another thread, my BB rogue got immortal in another way. She was killed health/stamina 22 times, when she finally succumbed at the hands of two guards. The rogue has a hard time letting go of Eora and enter the world beyond.